NEW BRITAIN - With so many new players coming to New Britain this season, there were questions surrounding every part of the team. But if one thing is for certain in the early going, it’s that the Bees have a solid bullpen upon which to rely. An area of the team that often struggled last year, the bullpen hasn’t had any such issues at this point of the season, combining for an ERA of 1.43, which ranks first in the Atlantic League. The Lancaster Barnstormers are second with a 1.75 ERA. Relievers Mike Hepple, Sam Gervacio, Brandon Fry and Kevin Chapman all have yet to give up an earned run. As a staff, the bullpen has thrown 56 innings from the mound and given up 50 hits in the process. The bullpen has also combined for a WHIP of 1.16. New Britain is just 5-10 to start the season, but its pitching has won those five games. The Bees are 5-0 in games they hold a lead at any point. Another key arm out of the pen is Manny Delcarmen, a former World Series champion with the 2007 Red Sox. The 36-year-old has had a strong start to the season in New Britain, giving up just one run in six appearances. Backman said before the season started that he saw as many as five guys out of the bullpen who could take the closer role. But so far this season, it looks like Chapman is that guy. He has picked up both of the team’s saves so far, striking out 10 batters in 5 1/3 innings pitched. Backman also said before the season started he believed the team can play “five inning games,” essentially saying that if the team has a lead, the bullpen will close it out. But the team’s offensive struggles have prevented that from happening. Jonathan Pettibone, a starter on the team, said having such an effective bullpen makes the starter’s job a lot easier. 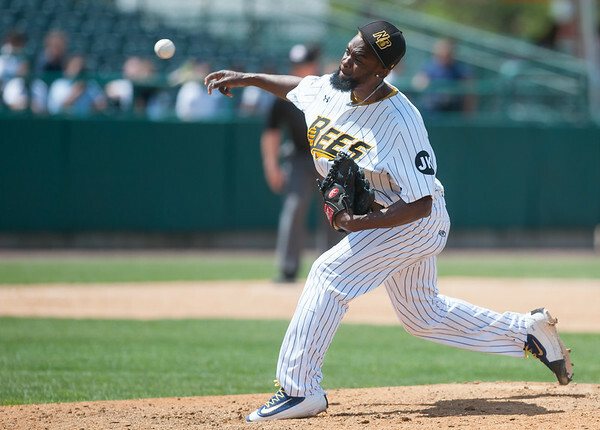 Posted in New Britain Herald, New Britain Bees on Tuesday, 15 May 2018 20:21. Updated: Tuesday, 15 May 2018 20:40.